Due to their design, keyboards are able to be affected by elements gumming up the mechanism, preventing the keys from smoothly lowering and raising when pressed. While old-fashioned keyboards are less susceptible, chicklet-style notebook keyboards, like the ones used in the MacBook lineup, can easily be stopped from working efficiently if dust, crumbs, or liquids enter under the keys and impact the mechanism. Apple has attempted to solve this with the introduction of a third-generation butterfly mechanism, with a silicone membrane used both to deflect dust and to quieten typing. While promising, it remains to be seen if the change will provide long-term relief from the issue. Even so, Apple is considering ways to eliminate the problem, by removing the need for loose keys or a switching mechanism at all. Instead, Apple suggests the use of a single panel. Published on Thursday by the U.S. Patent and Trademark Office, the patent application for the simply-named "Computer with keyboard" that effectively describes how a keyboard could be created without moving components. In Apple's proposal, a glass sheet would be used in place of the movable keys, with raised sections to denote where each key is located. As the user presses down on one of the raised key sections, the keyboard detects the force input to that "key" and handles it in the usual way within an application. The use of raised keys would enable the proposed keyboard to offer a form of tactile feedback to users, allowing users to know exactly where their fingers are placed in relation to the center of each key. While this is similar in concept to a virtual keyboard on a screen, such as on a smartphone or tablet, it is much harder to touch type on a virtual keyboard due to not being able to touch the keys. To provide a level of springiness similar to a normal key's deflection, Apple suggests the use of a raised side wall around the raised key region, which can be configured to deform on input. In some elements, the keys can buckle, with a lower layer including elements to push the key back into place and to detect each press. As the panel is glass, this can allow for the key symbols to be defined by a secondary display in the lower section of the notebook, making it relatively simple to change the keyboard layout to a different language or an application-specific version. Furthermore, side sections could be used as a form of trackpad alongside the keyboard element. While the idea can certainly eliminate the potential for dirt-based keyboard mechanism failures, it also has a byproduct of potentially making the keyboard even thinner, allowing for a bigger battery to be included, or an overall slimmer notebook profile. As Apple does file a number of patent applications on a weekly basis, the publication of an idea is not a guarantee the concept will appear in a future Apple product, but does suggest areas of Apple's interest. 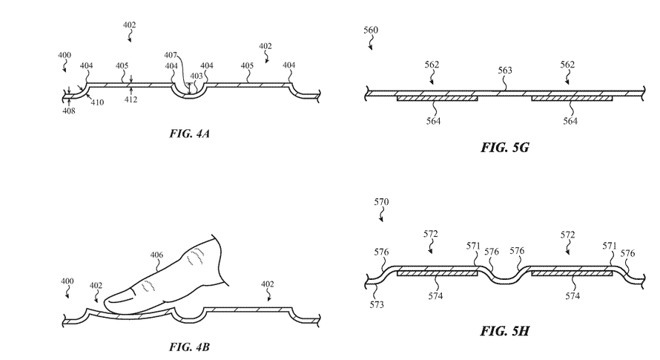 This is far from the first keyboard-based patent Apple has applied for. In March 2018, it applied for a "keyless keyboard" that used a similar secondary touchscreen display in the lower section of a keyboard, but more talks about the use of flat touch panels than versions with keyboard-shaped raised elements. In February of the same year, Apple was granted a patent for "Dual display equipment with enhanced visibility and suppressed reflections," again suggesting the use of a touch-enabled OLED display as a keyboard. 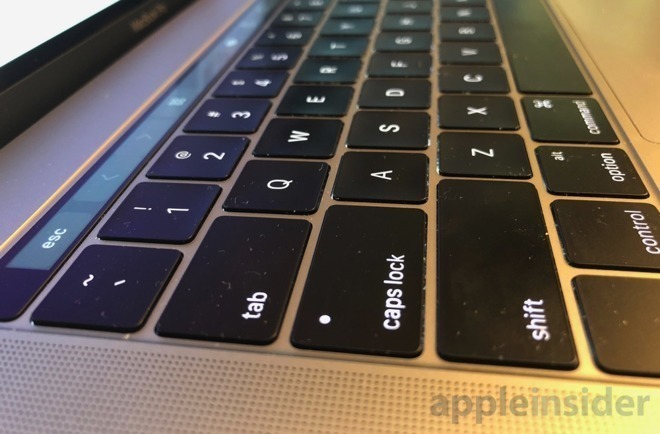 In August, a trio of filings named "Device having integrated interface system" largely suggested the use of plastic or glass to alter the surrounding area of the MacBook keyboard, and even the keyboard itself, with touch-sensitive capabilities. Doing this in a way that doesn't feel terrible will be very difficult. The lack of movement may feel quite odd (I can't see the glass keys deforming a lot). At least the raised key areas will provide some 'layout awareness' to the user. And good use of haptic feedback may provide some useful level of interaction upon a press, although whether it's as nice as a real keyboard is another issue entirely. Now we know another reason for haptic feedback - a new glass keyboard. I am certain Apple can make it work - as to if I would want one for production typing is another matter - the "old" keyboards, like on the Old MacBook Air are what I prefer. I'm sure this would be hard to do. But I still have to remind myself that the press on the track pad isn't an actual click in. I feel like they'd need a ton of haptic engines for this though. This would have to be pretty thin, bendable glass. Even though such a material exists, it’s got to be somewhat fragile. as to the feel, I’d like to remind people that expectations for keyboards have changed greatly since the great IBM and Mac keyboards of the past, which were VERY expensive. My Mac keyboard from 1992, which I still have but can’t use, cost $289 back then, almost $600 in roday’s dollars. We expected to spend a lot on pro keyboards, and many computer companies offered that, as well as less expensive models. The keyboard wasn’t included in the computer package because of the cost, and was sold separately. how may complainers are willing to spend $600 on a keyboard today? I can tell you that the models from manufacturers with “real” Cherry, or equivalent switches aren’t nearly as good as those old keyboards, nor do they last as long. we’re now used to the short press keys, and they continue to get even shorter and less clickey. Get used to it. Can someone please send Tim, Phil and Jony an Atari 400 to type with? If single glass slab or some other mechanism, for keyboard/keys durability, reliability is most important requirement. Yup. They’ve been training the user base for years. Nearly nobody uses the Apple (Magic) Mouse - soon MacBook users will need to attach an external keyboard to type efficiently??? Actually, you can buy a brand new Model M keyboard with buckling spring keys and replaceable keycaps for about $110. I got one a few years ago for work. The keyboard was originally from IBM, which then spun a lot of computer accessory hardware off into Lexmark. Eventually, Lexmark decided they didn't really want to make the Model M keyboards either, so some employees bought the patents and production equipment. They are now sold under the brand Unicomp. You can get them in a few color schemes, USB or PS/2, and they're available in a few layouts (including Mac layouts with Command keys and the common device keys like brightness, volume, Exposé, &c.). idiotic idea from a company that has lost direction. Apple has gone down this path of forcing design changes on customers that neither improve their experience nor add anything significant to the product. They are just changes for changes sake. The headphone jack went away because? The adoption of USB C at the exclusion of other standard ports like USB A and SD cards? I hope they do adopt the glass keyboard. If it's anything like the force touch or haptic feedback it will be a dismal failure. All the legions of coders and developers who adore Macbooks will ditch them for HP and Dell. After a dismal sales meeting they will finally be forced to assess their ivory tower design ethos of putting form at the expense of function. The best “keyboard” ever made was the IBM Selectric typewriter and it’s been all downhill since. There are 10 year old kids who have only ever typed on an iPhone or iPad. I’d say this is coming to market at about the right time to ensure they continue typing on virtual keyboards without interruption. Seems like the new norm to me. Tomorrow’s coders May very well prefer glass virtual keyboards. How do you know, since Apple doesn't release figures for mouse sales? I’m familiar with them. All I can say about them is meh. Reminds me of that Friends episode where Joey uses the thesaurus to write a letter and it ended up being nothing but a bunch of unintelligible phrases linked together by punctuation. Just because you use the big boys phrases (i.e. known troll memes), doesn't mean you're any good at it. Honestly, that is one of the best two-button mice out there. Once you get used to it, the ability to swipe and pan on the mouse makes it very efficient! The second generation of it is nearly perfect in every way (except charging, charging it is a real bummer). Not really. The thinner glass gets, the more flexible it becomes. Get a tempered glass screen protector for an iPhone and you'll find that you need to almost fold the paper-thin glass before it will break. I think his point is that most everybody finds the built-in trackpad on a Macbook to be sufficient. Especially if you install Bettertouchtool, which gives a wealth of additional options. That sounds like an awful idea, the current MacBook keyboards aren't great and have their set of issues. Introducing glass keyboards doesn't seem like a solution to the problem at all, in fact, it may just make matters worse. Don't fix it if ain't broke, they should really stick to their old style keyboards, I'm not sure how they'll manage it thanks to that obsession with thinness but maybe it can be done. Microsoft has managed to create a superthin keyboard with great travel and tactile feedback on their Surface Pro Type Covers, I'm sure there's a way to achieve something similar on the Apple side. It's funny that Microsoft is actually taking Apple's place in many respects. Just look at the current Surface sales, they've been incredible for Microsoft. Microsoft has already exceeded expectations and now they are predicting 20% growth on top of that. I think they're really doing well considering that Microsoft has gotten into the hardware business very late compared to Apple. I also feel they are innovating in many more areas and in many cases outshining even Apple's Macs. The keyboards, trackpads, design are all on point and even the software has reached a stage where it's a lot like Mac OS. I wish Apple would change direction. Some Mac users including myself have jumped ship, I sold my Mac for the simple reason that I just got sick and tired of paying for premiums and getting less, not only that I just feel like Microsoft now is providing a better experience for my use case. The keyboard issues, flex-gate, bent iPads, iPhone 6 performance throttling etc.. all tell us that the quality assurance has taken a dive and Apple doesn't seem to care. The recent flex-gate issue which is leading to display failure early thanks to a fragile cable is going to cost customers $600+ for repair because the cable isn't durable enough to last very long. The bent iPads will not be covered, but people are eligible for a refund within the normal period for any device. The issues with keyboards have been semi-resolved but I guess we'll have to see how the new keyboards work out. Initially, customers were forced to pay around $700 for out of warranty keyboard repairs until Apple provided free replacements later on. It's really not looking good for Apple. I'm not saying it's a failing company, it makes way too much money for these issues to make a dent in the near future but it does mean customers will suffer in the end.